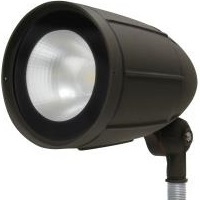 The outdoor rated LED bullet flood fixture is constructed with precision die cast aluminum housing and tempered glass with a ½" NPS threaded arm. It is ideal for use in landscape, facade and sign lighting applications. Fixture can be surface mounted directly to electrical boxes or posts with ½" threaded bushing.